Executive Committee members of the ruling Ethiopian People’s Revolutionary Democratic Front (EPRDF) on Tuesday said the Horn of Africa nation will fully accept the 12 December 2000 Algiers Agreement between the governments of Eritrea and Ethiopia. The two neighbors fought a war from 1998 to 2000 over the border dispute, which left about 80,000 people dead. They signed a peace agreement in 2000, which established the Eritrea-Ethiopia Boundary Commission (EEBC). 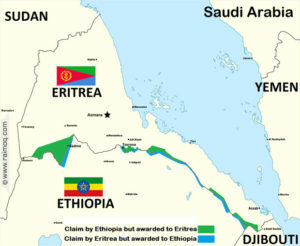 The boundary commission ruled that the disputed territory of Badme, the epicenter of the war, is Eritrean territory. However, Ethiopia backtracked from its commitment and rejected the commission’s decision. The Eritrean government contended that there could be no resolution until the Ethiopians withdrew their troops from Badme, as the commission had ordered. With the new development, Ethiopia will have to withdraw its occupying forces from all territories awarded to Eritrea. Ethiopia also called on Eritrea to reciprocate the decision and work toward bringing a lasting peace between the people of the two nations. Ethiopia’s new Prime Minister Abiy Ahmed had promised to make peace with the country’s northern neighbor after taking power earlier this year. Posted by Geraldine Boechat on June 6, 2018. Filed under News. You can follow any responses to this entry through the RSS 2.0. Both comments and pings are currently closed.